We recently updated all our libraries. We will publish posts detailing the updates over the next few days. This is the first one. 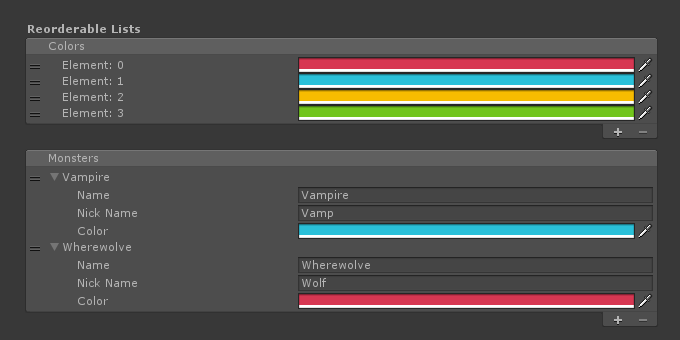 Added new attributes and drawers (Readonly, ReordableList, WarnIfNull). We also added a detailed example, showing all the drawers – old and new – in action. Added state trackers. A state tracker is a class in the same spirit is StateMachine, and was originally designed to implement showing a loading graphic for asynchronous actions (such as making WWW calls) that happen in no particular order, and can overlap. See StateTracker, TimeStateTracker). Improved the design of response curves, and added new response curves (StepResponse, DitherResponse). We also added a common interface for this class, and a new Evaluate function to mimic Unity’s animation curves and gradients. Added a custom editor class for GLMonoBehaviour, and added support for automatic inspector buttons for annotated methods. This is also demonstrated in the new example mentioned above. Removed the Gamelogic top-level menu and moved items to appropriate menus. Renamed the Plugin folder to Plugins to improve compilation times. (If you upgrade, make sure to make a backup first, and rename your Plugin folder to Plugins before to prevent duplicate imports). Made several small additions, bugfixes and refactorings.